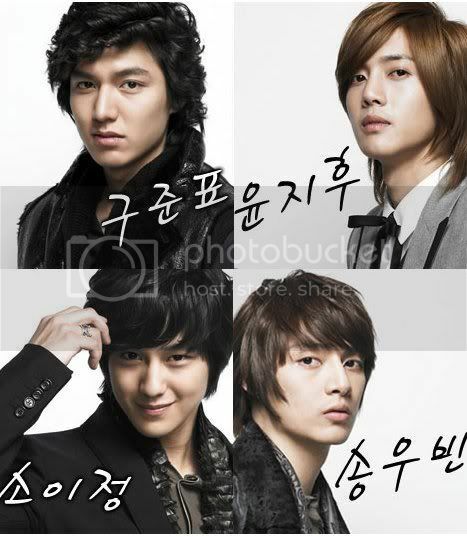 OMG, I am (L)ing Boys Over/Before Flowers!! So good... I'm hanging out for ep 9 and 10 subs though. ARGHHH... At times like this I wish I were a Korean speaker!! Maybe I should just be patient, concentrate on my new job, and wait a few weeks when it's all out?? ARgh, I don't think I can wait. I must say how much I HATED Gu Jun-Pyo's curly hair? But he has grown on me and I love his naivety and innocence despite his tough cool exterior! Although I'd have to rank Yi-jung quite high too... The good looking artist F4 member. How HOT is he? What would your rankings of the F4 guys be? I'm sorry but I absolutely hate the F4 guy who keeps going "yo yo yo" so try hard and stupid! If I had to rank, it would be close between Jun-pyo and Yi-jung, with a close second of Ji-Hoon. Hahah, I get confused when you guys talk about F4. Because the original F4 are the 4 guys who played F4 in the Taiwanese version. They are an actual band called F4. So I keep thinking of the Taiwanese actors. So confusing. If I had to rank. It would be Ji-Hoon first. hHAHA, Only because I've seen Yi-jung, the actor, in another drama before, and he looks alot better in BBF. And Jun-pyo took a while to grow on me. Ji-Hoon was the obvious good-looking one. My computer's playing up, so I haven't been able to watch ep 8 of BBF yet. Need to get it fixed ASAP! I'm so glad I can get on here and whinge a little about the waiting of English subs... they're really mean if you keep talking about them, which is a shame. Jun-Pyo took a while to grow on me too... I love it! I wanted to put up some pictures but my net was playing up. It's killing me because I have episodes 9 and 10 of [acronym=Boys Before Flowers]BBF[/acronym] / [acronym=Boys Over Flowers]BOF[/acronym] but I am still hanging out for a fansub group to finish subbing it. I have checked out the subs on that site (what will remain unmentioned) but I don't like the quality of the episodes (very blurry, as opposed to the clear HD version of the episodes I obtain elsewhere) and also the subs are sometimes too hard to read and unclear. So I'm hanging out for it!! But I do know two kisses occur in these two episodes. And officially it's their first kiss! I mean she did sorta kiss him when she saved him from drowning in the swimming pool. But this is the first time she's let him kiss her. I am loving Jun Pyo... he has this confidence about him that draws people to him. Yes he is an arrogant a$$ but a hot one. The curly hair, for me, has been accepted. I don't mind Ji Hoo, but he doesn't have a very expressive face does he? I love Yi Jung really does have the cutest smile with a dimple!! Do you think they overuse the OST or what?? I think the only Korean film I've seen is Volcano High, which is good but very weird. It's like a cros between Harry Potter and the Matrix. Did you all see this in the newsletter?? Wooo for only 3-4 people posting here, we managed to be one of the top 5!! Lol - I haven't watched that movie, it sounds a bit weird. Was it any good?? Oh I tried to watch Romantic Princess, but I couldn't get into it. I'm not a fan of Angela Zhang (the main female lead.) I reckon she can't act. First saw her in My MVP Valentine, and I didn't finish that one either. Which was a shame, because 5566 were in it, and I really wanted to watch it because of Jason Hsu (He's SO CUTE!) But I just couldn't stand watching the lead actors act (both male and female lead!) Same with Romantic Princess, I really wanted to watch it because Wu Zun was in it and I'm a major fan of Wu Zun (He's SUPER SUPER CUTE!) but I couldn't stand Angela's acting ... Why oh why did they have to cast her opposite Wu Zun?! Oh! I've seen Witch Yoo Hee! (aka Witch Amusement) I enjoyed it alot. Jae Hee is so COOL, hahah. You have GOT TO watch Delightful Girl Choon-Hyang. Jae Hee in there is super cute and super FUNNY! The OST for Witch Amusement is pretty good too. I like the song by Ashily, have it as my ringtone ^^ HAHA the BURNT CARROT is soOO CUUUTEEE. I prefered him over the main lead in Goong. I wanted him to get with YEH! I'm upto date with BBF, Ep 9 (Since Ep 10 has no subs yet). HHEHE. One of the songs in BBF sounded alot like Ashily singing, and when I checked in the OST, it was her! Cute song. Episode 10 subs must have come out today - go get them now!! :P I've been so bad reading it off that dramabeans site... but I can't wait!! And I've watched Delightful Girl Chun-Hyang. It was really good... the main female lead was also in [acronym=Boys Over Flowers]BOF[/acronym]. I started watching Witch Yoo Hee but lost interest, Linja you're the third person to say it's good, so maybe I'll watch it. That song by Ashily - isn't that also featured in BOF? I actually don't like it very much. And I agree about Angela Zhang, she pisses me off... hate her acting, but I persisted for HOT Wu Chun! He is soooo adorable!! ^^ HAHA the BURNT CARROT is soOO CUUUTEEE. Jossie! Yay! Our thread made it to the top 5 threads in the Library, no, I didn't know about it, I didn't get the newletter :( but I'll check that out soon.....hopefully. anyway, I haven't had time to watch BOF, I'll just get it on dvd when it comes out. I ccb anymore, expecially with school coming out. Oh and btw Jossie, how's work going? Are those kids good? Woo double release of subs - episode 11 and 12! So excited, and episode 13 comes out tonight with episode 14 tomorrow night... but then again its another week or two week wait till the subs are out. Yes, I'm addicted, it's a problem I have :P Me and my obsessions that's how my friends know it's me! ;P I did the exact same thing with Coffee Prince, though I promised myself I wouldn't!! What with all the kidnapping, almost dying in the snow, oh almost getting molested and the list goes on. And what the heck is up with Jan Di and her inability to defend herself, so she becomes the damsel in distress like 3 times this whole series?? What happened to her spinning kick! Well, episode 13 and 14 were out last week and the English subs were released last night. I was ecstatic. Too bad my net is now capped. Thankfully I had episode 13 already... but now have to wait for the end of this month before I can get episode 14. I'm seriously in love with this series. So much so that I even want their mobiles! It's called Anyphone or something. Which, according to my sister who works for one of those mobile dealers - Soul and now 3, is Australia's Samsung! But considering how Korea's fashion and trends etc are so much earlier than us, it doesn't seem we have it yet. It's this touch screen phone and it appears that you can change the back covering. And you can also observe my obsession in MSN and here in my signature! :P I'm an obsessive picture collector too!! haha, I'm here, I'm here. I've put BBF on hold for a bit, and I'm watching Three Dads and One Mom at the moment, upto the second to last ep (Ep 15). It's hilarious! Love it! Need to catch up on BBF now. And that was 2 weeks ago episode. I've still gotta get ep 15 and 16, but in no hurry since the subs are still probably gonna take a few days to load! EDIT: It's impulsive and silly. Something I shouldn't be doing at my age too... sigh. But I'm obsessed, and when I get obsessed with stuff (like K-dramas... in my childhood I was so obsessed with Sailor Moon, collected EVERYTHING) I always COLLECT. I guess it's to fill the void in my life where nothing much is going on! So I collect billions of pictures, icons and banners. I parade them in my msn display pic and as you can see, in my signature too. Since having access to netbanking and now the wonders of ebay having paypal which means you can use your bank account to get stuff, and not a credit card, I have taken to buying some stuff overseas. I bought the couple cross from the k-drama Tree of Heaven (it is the most heart wrenching saddest series ever. It's only 10 episodes but makes you cry till you have swollen fish eyes the next day): see here Tree of Heaven necklace. Which I don't know why I bought, considering I'm not religious at all, I just liked it because it reminded me of the series, and how bittersweet it was, and the significance of the necklace. It's almost wishful thinking, you know? And then I got Rain's key necklace that he wore in Full House - but I didn't read the description properly - ie the measurements - because it turned out to be much bigger than Rain's versions. And finally for [acronym=Boys Over Flowers]BOF[/acronym] I have caved and bought the Moon and Star necklace that Jun Pyo made specially for Jan Di. I'm guessing because the series is so popular at the moment, that this is why it is a bit expensive. And it's not as though it's the real one - apparently a jewellry maker called Stone Henge makes the real versions (they also made some of the F4's rings). This necklace is just a replica. Certainly cheaper than the real deal. I need a necklace and I'm obsessed. So it didn't take much to topple over and buy it!! I hope I won't regret! So everyone has been rather quiet. I'm a strong follower of the BOF series still! But so much has been going on in the past few episodes, and so much has gone on for the actors!! Did you girls manage to watch the BOF special? I found out that the version I was given was actually the original drama version of BOF. No I didn't watch the BOF special, my mum is watching the current version of BOF and is enjoying that. I'm upto episode 13 of BBF. I would have probably finished it by now, but I seriously keep putting it on hold to watch animes. haha. Oh, I didn't know there was a special. Will check it out. Did you guys know that one of the actors in BBF committed suicide? One of the 3 means girls, that's always picking on Jan Di. The one with the two long pigtails. One of the side kicks. After Ep 13 she's not seen anymore. Sad. She hung herself from the balcony stairs or something. And her poor sister found her like that. The cause is believed to be depression. They had to have a funeral for her whilst in the midst of filming. How horrible for them, Would be so hard to continue acting. On a happier note. I LOVE HEAVEN'S TREE!! The sweetest drama I've seen. Made me cry alot, cause of those two main actor, darn, they sure know how to make waterfalls. And I'm trying to get back on another K-drama, East Of Eden, such a long drama, over 50 episodes. And I'm only upto like Ep 20. Yeah I heard about that. It's really sad. It's come out that she committed suicide because a Production Director was using her, and abusing her. If you know what I mean. All this evidence is coming out. Apparently the asian industry is a lot like that. To get far and to go places, and if you have low self esteem, you may be forced to do particular things you don't want to. It's sad news, but moving on - East of Eden has Kim Bum no? The F4 guy who plays Yi Jung? I'm hanging out for episode 21... it's so good! And second OST has come out, and just today/last night a special OST has been released! Loving the new T-Max song. I'm watching nothing else Korean but BOF :P I'm addicted and don't have time for any other obsessions. Linja - yeh I LOVED Heaven's Tree too. I cried heaps bad too. The end where she's like clutching her chest where her heart is was the most heart wrenching. 10 episodes, but every episode was teary, and bawling. I wouldn't put myself through it again, but it really is the sweetest and most bittersweet story ever! How will I continue living without my weekly double dose of BOF? I was thinking, 'It is pretty silly and childish for a 24 year old teacher to be obsessing about Korea and Korean dramas as much as I do.' It's actually quite immature and quite adolescent... And I'm not trying to offend anyone else, but it certainly is not "teacher-like" behaviour. Guess I don't fit the mould. But besides this, I've come to see I DEPEND on k-dramas like BOF. I really fall in love with those guys and really truly yearn that something that wonderful could happen in my life, that I might fall in love like that one day. I joke with my friends and family that k-dramas keep me going. My life is pretty mundane, and no love life to speak of. With k-dramas, there's something to look forward to, something to laugh, cry, get frustrated by. It helps distract me from that emptiness in my life - no love life, very few friends. Sigh... don't mind me, I'm feeling mopey. I won't stop my obsessions, really, I can't anyway. I can't help but become addicted. And not much else exciting happens in my life, so this adds to it..
Jossie :P your obsessions are only typical of a human being ::) like my teacher, I believe he's like 35 or something now and he's obsessed with the band KISS. Ahh so BOF is finally over. I'm all tired out and cried out. It was a really nice last few episodes, very dramatic and all, but I really, really like it. And now the obsession has ended - no more new episodes - I am feeling very empty, as though there is a vacuum left over from the absence of BOF!